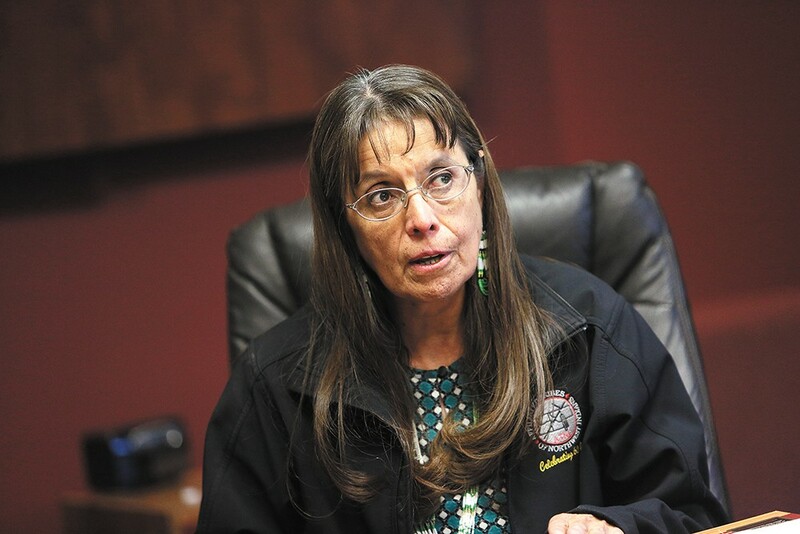 Spokane Tribal Chairwoman Carol Evans: "The Spokane Tribe has, in our opinion, not been properly compensated." U.S. Secretary of the Interior RYAN ZINKE met with Spokane Tribal Business Council leaders in Wellpinit last week in part to discuss legislation that would pay reparations to the tribe for land that was flooded after construction of the Grand Coulee Dam. For years, the tribe has asked for compensation for the loss of historic salmon runs, tribal lands, schools, roads, farms, burial sites and culturally important river access after the dam's construction, but legislation has stalled in Congress. "The Spokane Tribe has, in our opinion, not been properly compensated," Spokane Tribal Chairwoman Carol Evans says. "So every year we continue to go back and ask for congressional leaders to support that legislation." Sen. Maria Cantwell, D-Washington, has introduced legislation that largely mirrors a settlement the federal government came to with the Confederated Tribes of the Colville Reservation in 1994. Under the bill, the Spokane Tribe would get a one-time payment of $53 million and annual payments based on the value of power sold by Bonneville Power Administration. "This is one area where Maria Cantwell and I can work together," Zinke says. "Clearly the tribe, in my judgment, was wronged." Reached for comment after Zinke's visit, Rep. Cathy McMorris Rodgers, R-Washington, says she also believes the Spokane Tribe was wronged, and that she has worked on legislation to identify a settlement with them and other property owners. "Senator Cantwell and I have had many discussions about a possible path forward in Congress, and are working with the tribe to go through the settlement process," McMorris Rodgers says by email. "I appreciate Secretary Zinke taking the time to visit Wellpinit to hear firsthand the concerns and look forward to working with him on a settlement agreement that would recognize the impact of the Grand Coulee Dam on the Spokane's Tribal lands and livelihood." The original print version of this article was headlined "Together Again?"